For your enjoyment and entertainment, photos of the new walk-in tanks in progress. Hover over individual pictures for captions. There are in fact several, both two regular circuit breakers and two ground-fault interrupters. Turns out it was the breaker on the power bar, so I reset it and gingerly tried the pump again. Nothing but a weird humming noise. I turned it right back off. The tank we acquired included a powerful pump and a swimming pool-sized filter. Or at least, it had the parts, but for weeks I had no way to confirm whether they actually worked. It can be harmful to turn on a pump with no water in it, and in any case would prove nothing except that it made noise. To test it, I had to get new PVC piping to replace the parts that had been hacksawed up when the last owner took the tank apart. Home Depot doesn’t carry 1½-inch flexible PVC for plumbing this sort of thing, though — it seems to be kind of a specialty item for hot tubs and saltwater aquariums. Last week mail-order finally arrived, and I could cut up and dry-fit everything in the driveway. Here’s the tank with water in it and the pump running at last. The picture hardly does justice to how powerful the pump is — that water is churning hard. 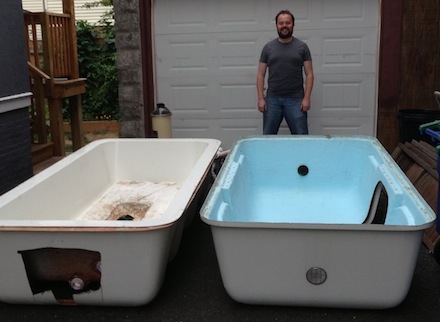 The biggest news on our recent progress is that we’ve acquired our first float tank! We found a great deal being offered on an old tank, and decided to take the leap. 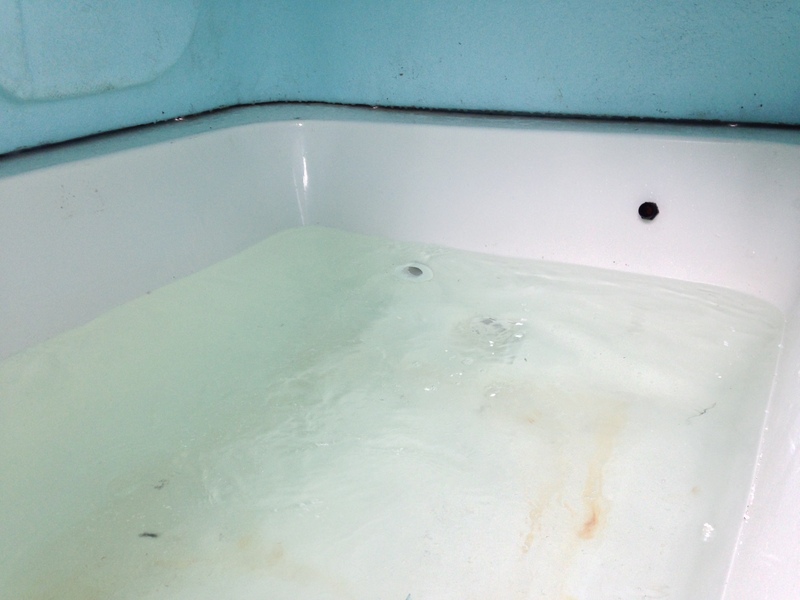 It’s a Float To Relax tank from the 80s that had been residing for a while in someone’s yard, so it needs quite a bit of TLC before it’s going to be ready to go. The seller had inherited the tank, and did not even know the manufacturer or model, never mind whether all the parts worked. Most significantly, the temperature control system is entirely missing, so I’m going to have to rebuild that. And the pump and filter are disconnected in enough different pieces that I do not yet know if they even work. Our calendar is open to everyone! Reservations are usually necessary: view availability on our public schedule. For same day openings you can follow us on Twitter @floatboston, or contact us at info@floatboston.com if you’d like to get on our wait list for a specific day. We are open every day of the week! We have all our tanks up and running. Monday & Tuesday: first appointment at 7am, last at 9pm. Wednesday: first appointment at 1pm, last at 9pm. Thursday-Sunday: first appointment at 7am, last at 9pm. Join our mailing list and don’t miss a thing! Let’s Float summer challenge is back!